In appreciation of your purchase with Beryl Lane we currently have two online promotions for you to choose from! We'd love to see your purchase on! Share an image of you wearing your new purchase on our social media to receive a $50 Gift Voucher. 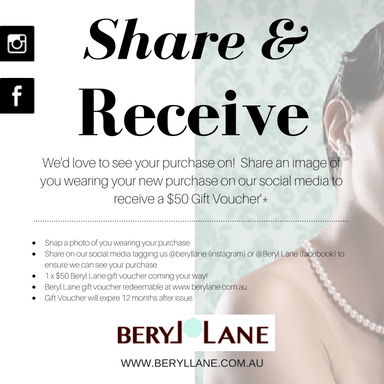 $50 Beryl Lane gift voucher coming your way! We'd love to hear from you again! So we're offering 10% off your next purchase! 1. Information on promotion forms part of the terms of participating. Participating in the "Share & Receive" promotion is deemed acceptance of these terms and conditions. 2. Open to any person who has made a purchase from the Beryl Lane online store from 1st October 2016. If the purchase was a gift, the person can be the one who has received the gift. 4. Expiry date for "Share & Receive" promo is 12 months after issue. 5. Expiry date for "Coupon Code" discount is 31st December 2018.